Sources of vitamin K include K1, which is synthesized by plants and is present in food, and K2, which is synthesized by bacteria in the intestinal tract. Vitamin K1 and K2 are fat-soluble compounds. K1 is absorbed in the proximal small intestine and requires bile for absorption (being fat soluble) whereas K2 is absorbed in the ileum and colon. Vitamin K3 is a synthetic compound that is less lipid soluble and is absorbed in the ileum and colon. Once in the liver, vitamin K works to activate coagulation factors but also has many other functions. Vitamin K acts as a cofactor for the enzyme γ-glutamyl carboxylase, which modifies coagulation factors II, VII, IX and X by adding a carboxy (COOH) group (with carbon dioxide) to a glutamic acid residue in the amino-terminal domain of the factors. This process creates γ-carboxyglutamic acid or what is called a Gla domain. Modification of these coagulation factors in this way renders them functional because it allows them to bind calcium, such that they can then bind to phospholipid (mainly phosphatidylserine)-bearing membranes (on platelets, in particular). This is necessary for the assembly of highly active coagulation factor complexes, which is required for coagulation and fibrin formation to proceed. Vitamin K is also required for functionality of proteins C, S and Z, which are important inhibitors of coagulation (activated protein C inhibits activated factors VIII and V, inhibiting thrombin generation, with protein S as a cofactor; protein Z inhibits activated factor X). The vitamin-K dependent inhibitors and coagulation factors are synthesized in the liver as “inactive” or non-functional precursors. They require modification with γ-carboxylation in order to be functionalized – this modification process requires vitamin K. During the carboxylation reaction, reduced vitamin K (hydroquinone) is oxidized (to the vitamin K epoxide). The two reactions (carboxylation and epoxidation) are linked, such that the carboxylation reaction cannot occur without reduced vitamin K being available for oxidation. Thus, the γ-carboxylase enzyme has been called a carboxylase and epoxidase. The vitamin K epoxide must be reduced back to the hydroquinone form (recycled) to participate in the carboxylation reaction. This is accomplished by two enzymes, one of which (vitamin K epoxide reductase) is inhibited by anticoagulant rodenticides. These toxins inhibit vitamin K recycling from the oxidized to the reduced form and the absence of reduced vitamin K halts the carboxylation reaction so synthesized coagulation factors cannot be modified and are non-functional. Since these factors cannot bind calcium or phospholipid membranes, they cannot participate very well in fibrin formation so the animal will bleed (although inhibitors are affected as well, bleeding symptoms due to lack of functional coagulation factors dominates over thrombosis, which is not recognized in affected animals). Prolonged screening coagulation assays: Long PT and APTT. The TCT and fibrinogen concentration would be expected to be normal. Of these two assays, the PT is more sensitive than the APTT as FVII has the shortest half life of the vitamin K-dependent coagulation factors. Proteins induced by vitamin K antagonism/absence (PIVKA) is a modified coagulation assay that may be as or slightly more sensitive than the PT, however this assay is not offered by most laboratories and a prolonged PIVKA is not specific for vitamin K-dependent disorders, with values being prolonged in other conditions, such as inherited disorders and DIC. Low factor VII activity: Measurement of FVII coagulant activity can be performed as a sensitive test for vitamin K-dependent disorders (because FVII has the shortest half life as mentioned above). However, low levels of FVII coagulant activity (FVII:C) are seen in synthetic hepatic failure and inherited FVII deficiency. Low protein C activity: Protein C activity is also anticipated to be decreased with vitamin K deficiency/antagonism. However, this protein will also be decreased in portosystemic shunts, synthetic liver failure and DIC. Screening for anticoagulant rodenticides: Since toxicosis is the most common cause of a vitamin K-dependent coagulopathy, the gold standard test is measurement of the specific toxin involved using high-performance liquid chromatography, but this test is expensive. Vitamin K epoxide levels: Measurement of vitamin K1 epoxide (increases with toxicosis) or the ratio of vitamin K1 epoxide to vitamin K1 (increases with toxicosis) is done in some countries to diagnose anticoagulant rodenticide toxicosis (Mount and Kass 1989). The most common cause of vitamin K-dependent hemostatic disorders is anticoagulant rodenticide toxicosis. This is most commonly reported in dogs (Waddell et al 2013) and is less frequent in cats (Kohn et al 2003), horses (Carvallo et al 2015) and ruminants (Caloni et al 2016). Even though vitamin K is required for activation of inhibitors, the lack or antagonism of vitamin K results in a hemorrhagic diathesis due to inadequate coagulation factor activity (particularly thrombin) and lack of fibrin formation. Clinical signs mimic that seen with coagulation factor deficiencies, including spontaneous hemorrhage into body cavities, subcutaneous hematomas and prolonged bleeding from wounds. The hemorrhagic diathesis is probably the most severe of any disorder (acquired or inherited) of hemostasis with massive bleeds, often leading to sudden death or hemorrhagic shock which can be fatal. The vitamin K-dependent proteins are factors II, VII, IX and X, and the inhibitors, protein C, S and Z. Inherited disorders involving the vitamin K-dependent enzymes have been reported in Devon Rex cats and Rambouillet sheep. The Devon Rex cats (both male and females) presented with hematomas, conjunctival hemorrhage, hemarthrosis, and massive bleeding into body cavities. Coagulation testing revealed a prolonged PT and aPTT, with normal fibrinogen and platelet counts. They have reduced activities of factors II, VII, IX and X (II, IX and X < 20% activity, VII < 50% activity of normal feline pooled plasma). The abnormal coagulation times and bleeding symptoms were responsive to vitamin K1 therapy (Maddison et al 1990). The defect is due to an abnormal gamma-glutamyl carboxylase (carboxylase-epoxidase) enzyme (Soute et al 1992), which is required for activation of the vitamin K-dependent factors with vitamin K hydroquinone as a cofactor (see image above). The enzyme has decreased affinity for both vitamin K hydroquinone and the inactive coagulation factors. Once the inactivated coagulation factors bind to the enzyme, the binding affinity for the vitamin K hydroquinone is markedly decreased. This decreased affinity can be overcome with pharmacologic doses of vitamin K.
The Rambouillet sheep presented at a young age (both males and females) with subcutaneous hemorrhage, hemarthrosis and bleeding from the umbilicus (resulting in death from hypovolemic shock). They had a prolonged ACT, PT, and aPTT, with decreased activities of Factor IX and X (Baker et al 1999). Affected animals have been shown to have low γ-glutamyl carboxylase activity (Johnson et al 2006a), which is thought to be secondary to a single nucleotide polymorphism that generates a truncated protein (Johnson et al 2006b). Affected lambs do not respond to vitamin K1 therapy and vitamin K1 did not correct the factor deficiencies (Baker et al 1999, Johnson et al 2006a). This is the most common cause of vitamin K-dependent coagulopathy. Rodenticide-induced coagulopathies are fairly common in the dog and somewhat less common in cats. Clinical signs can vary and include lethargy, respiratory distress, lameness, cutaneous or internal hemorrhages, epistaxis and hemoptysis. Moulds in sweet clover can produce coumadins (dicoumarol) which can cause a vitamin K-responsive hemorrhagic disorder in cattle (Puschner et al 1998). Anticoagulant rodenticides interfere with the vitamin K-dependent carboxylation of factors II, VII, IX and X by inhibiting the epoxide-reductase enzyme necessary for reducing vitamin K epoxide, thus depleting body stores of vitamin K. As a result, only nonfunctional precursors of the vitamin K-dependent factors are synthesized. Coumarin compounds including warfarin, coumafuryl, brodifacoum, and bromadiolone have a half-life of up to 55 hours. In contrast, indanedione compounds (pindone, valone, diphacinone and chlorophacinone) have a half-life as long as 4 to 5 days and can affect hemostasis for as long as 30 days. In addition, the indanedione compounds may interfere with exocrine pancreatic function resulting in reduced intestinal absorption of vitamin K.
Coagulation screening tests in uncomplicated rodenticide toxicity are usually characterized by a prolonged ACT, PT, and aPTT (the PT is usually longer than the aPTT) with a normal fibrinogen concentration. The PIVKA test will also be prolonged. The platelet count is normal in many cases but can be mildly to moderately low if massive blood loss has occurred. Fibrin(ogen) degradation products and D-dimer may be detectable in some patients because of severe internal hemorrhage, especially if there is bleeding into serous cavities, i.e. peritoneal, pleural, and pericardial. In some situations, anticoagulant rodenticide toxicosis can mimic DIC. However, usually the PT is more prolonged than the APTT, there is no evidence of erythrocyte fragmentation (schistocytes, keratocytes, acanthocytes) and antithrombin activity is normal with anticoagulant rodenticide toxicosis, whereas typically in DIC, the APTT is usually prolonged to a greater extent and in more patients than the PT, antithrombin activity is decreased and red blood cell fragmentation is frequently observed (in up to 75% of patients). In addition, animals with DIC have another primary disease and are far sicker than animals with anticoagulant rodenticide toxicosis. Note that eccentrocytes (indicating oxidant injury) have been reported in dogs with anticoagulant rodenticide toxicity (mechanism unclear; Caldin et al 2005). Owners of an animal with any hemorrhagic diathesis should be questioned closely about potential access of their pets to anticoagulant rodenticides. Since factor VII has the shortest half-life of the vitamin K-dependent factors it is conceivable that with early detection only the PT will be prolonged. However, bleeding will likely not be present at this time and there will (hopefully) be a history of rodenticide ingestion within the past 24 hours. Clinical bleeding is generally associated when prothrombin (FII) becomes deficient, which would prolong the PT and APTT. Most animals will not bleed if FVII is the only factor that is deficient (only prolonged PT). The Comparative Coagulation Laboratory at the Animal Health Diagnostic Center now offers a vitamin K deficiency coagulation panel, which consists of a PT, APTT, TCT and factor VII:C activity. Note that the latter will be one of the first tests to be abnormal (low FVII:C) with anticoagulant rodenticides, but low activity can be seen in other conditions, such as inherited FVII deficiency. Because of the marked difference in the duration of action of coumarin versus indanedione compounds, identification of the specific compound ingested by the animal is important for planning treatment. The recommended treatment for coumarin toxicity is 1 to 2.5 mg/kg BW of vitamin K1 for 4 to 6 days. In contrast, treatment for indanedione toxicity may require doses of vitamin K1 as high as 5 mg/kg for 3 to 6 weeks. High-dose vitamin K1 therapy, however, should be administered with caution since vitamin K1 was reported to induce Heinz body hemolytic anemia in a dog when administered at 4 mg/kg for 5 days. 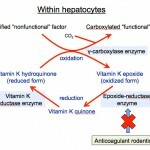 It must be realized that it takes several hours for vitamin K to work, when administered by any route (new factors must be synthesized because already produced factors are already circulating and cannot be rendered functional or modified after they have been secreted from hepatocytes). Therefore, in life-threatening situations (intracavity or CNS hemorrhage), a source of active coagulation factors must be given to the animal and vitamin K should not be relied upon to provide immediate hemostasis. Therefore, cryosupernant, fresh frozen plasma, fresh plasma or whole blood (if the former products are not available) should be administered immediately and vitamin K therapy begun by subcutaneous injection followed by oral dosing. Intravenous (due to anaphylactoid reactions [Mi et al 2014]) or intramuscular (due to the potential for development of debilitating muscle hematomas) injections are not recommended, nor is therapy with vitamin K3. Vitamin K1 treatment will stop the bleeding and cause the APTT and PT to return to normal or near normal within 24 hours. In some situations, where the rodenticide is unknown, some veterinarians treat the dog with vitamin K for 6 days, then monitor the PT 24 hours after stopping vitamin K1 therapy. However, there is always the potential risk that the dog will bleed in the interim. In these situations, it is better to treat the animal with vitamin K for a minimum of 1 month (however, vitamin K is very expensive, which can make it prohibitive in a large dog). This can be due to various causes, but cholestasis is the one we think of most frequently, because vitamin K is fat soluble. Cholestasis: Any cause of cholestasis (e.g. complete biliary obstruction) that results in decreased bile secretion into the intestine (bile is important for fat emulsification and hence fat and vitamin K absorption) or fat malabsorption (exocrine pancreatic insufficiency, severe infiltrative bowel disease) can result in decreased vitamin K. Therefore, the potential for bleeding due to vitamin K deficiency must be considered in the treatment of dogs and cats with certain types of diseases (e.g. hepatic lipidosis in cats) and for livestock raised under certain management conditions. Animals with these disorders should still get enough vitamin K from bacterial synthesis and absorption in the ileum and colon, but sometimes they do develop coagulopathies that are vitamin K-responsive. Antibiotics should be used carefully in such patients because of the potential of altering gut flora and decreasing K2 synthesis. Dietary lack: Dietary lack of vitamin K has not been reported as a cause of bleeding in adult animals. However, newborn animals are more at risk for bleeding due to dietary lack of this vitamin, for several reasons. Milk does not contain much vitamin K and the intestinal flora that is an important source of vitamin K is not well established until after birth. Additionally, the liver in neonatal animals is still immature and not as effective in the synthesis of coagulation factors as it is in older animals. Nevertheless, clinical bleeding attributable to dietary vitamin K deficiency is rare in newborn as well as in adult animals. Altered gastrointestinal flora: Alteration of the gut flora from chronic antibiotic therapy or ileal/pancreatic disease can result in decreased vitamin K production and absorption. Intestinal disease: Deficiency of vitamin K resulting from decreased absorption due to diffuse intestinal disease is a possible but uncommon cause of vitamin K-dependent bleeding (Center et al 2000). Liver disease: Some types of liver disease (even those not associated with cholestasis) can result in prolonged screening coagulation assays that are responsive to vitamin K therapy (Center et al 2000), however these animals do not frequently manifest with bleeding, so vitamin K is infrequently used to treat dogs or cats with liver disease. Porcine Hemorrhagic Syndrome: This was reported many years ago as a severe, sporadic, vitamin K-responsive bleeding disease in recently weaned pigs (Newsholme et al 1995). It is thought to result from a combination of factors including low liver stores of vitamin K, possible low dietary levels of vitamin K, and reduced synthesis caused by antibiotics added to rations. Drugs: Other compounds that interfere with vitamin K are sulfaquinoxaline (an antibiotic), which results in a severe decrease in prothrombin, which can be corrected with vitamin K (Patterson and Grenn 1975). Comparative Coagulation Laboratory at Cornell University: Facts on vitamin K metabolism and testing. Toxicology Laboratory at Cornell University: Perform anticoagulant rodenticide screens (for the specific toxins, e.g. brodifacoum, warfarin).